Cisco Digital Media Players. 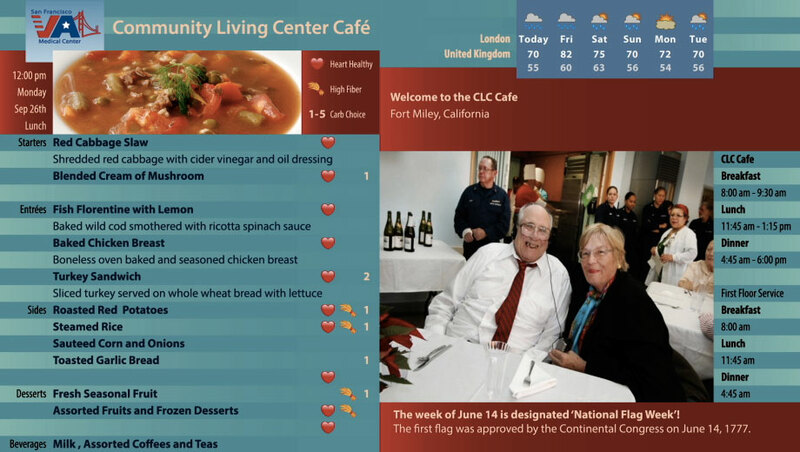 Menus automatically display by meal period (breakfast, lunch and dinner) on a 21-day menu cycle with healthy heart and high fiber nutritional menu label icons, and ‘carb choice’ rating numbers; a live weather feed for cities around the globe; live feeds from CNN, ESPN & Discovery News; a slide show; text announcement block; and animated food photography. © 2002-2016 Epicure Digital Systems.The ‘E plus mark’ is a trademark of Epicure Digital Systems. All rights reserved. The phrase ‘the cure for the menu bored’, LiveText, LiveMenu & NutriLive are service mark of Epicure Digital Systems. All rights reserved. All other trademarks belong to their respective owners. All rights reserved. Throughout this website, trademarks are used. Rather than put a trademark symbol on every occurrence of a trademarked name, we state that we are using the names in an editorial fashion only and to the benefit of the trademark owner with no intention of infringement of the trademark. No such use, or the use of any trade name is intended to convey endorsement or other affiliation with this site, except where there is explicit endorsement, or where the trademark belongs to Epicure Digital Systems.